What is it like to volunteer for Halifax Habitat for Humanity? Just ask Community Relations and Volunteer Coordinator Andy Thompson. Andy’s first connection with Halifax Habitat for Humanity was as a volunteer. Like many others, mind he felt that volunteering would provide him with new skills and connections in the community. The results did not disappoint. He enjoyed the experience so much, sale he joined the team. As the coordinator for volunteer activities for Halifax Habitat for Humanity – the Daytona area’s Habitat affiliate – Andy’s primary goal is to find a good fit for volunteers and create a great experience. From the time a new volunteer group arrives until the time they leave, he’s on point to help in any way he can. Start the day with a welcome and fellowship. Andy takes the opportunity to provide a brief background about Habitat and engages by asking volunteers to share what they know about the agency. It’s a great way to gauge what the community knows and where the agency needs to target its messaging. Of course there is a focus on safety and what precautions volunteers need to take, but when Andy gives an orientation he also shares about the different partnerships that arise from volunteering. He shares about the local businesses that contribute to Habitat for Humanity and the difference each and every volunteer makes when they give their time. Volunteers are on a mission. Air Force recruits laying sod and having fun. When volunteers arrive, they are on a mission to get started. Andy says there is always a scheduled start time, but when teams arrive a little early, he’s ready. The local Air Force Recruits are a perfect example of ready and eager. The volunteers arrived early, with gloves on, and ready to lay sod. They expeditiously finished the day’s work in just under two and a half hours. Andy says progress like that made by the recruits isn’t surprising. For decades, the business community has been tremendously supportive by identifying Habitat needs and finding ways they can help. Longtime Habitat corporate supporter Barton Malow Company recently sent a crew and equipment for one project and spread 40 yards of dirt and raked it out. It was a job that would have taken days, perhaps even weeks, to complete without the equipment and extra manpower. What speaks volumes about the Halifax Habitat volunteer experience is that every group that comes out wants to come back. Andy says even the volunteers who participate because of court ordered community service hours want to come back. Volunteers have spirit, yes they do! It’s hard work but volunteers make it fun. 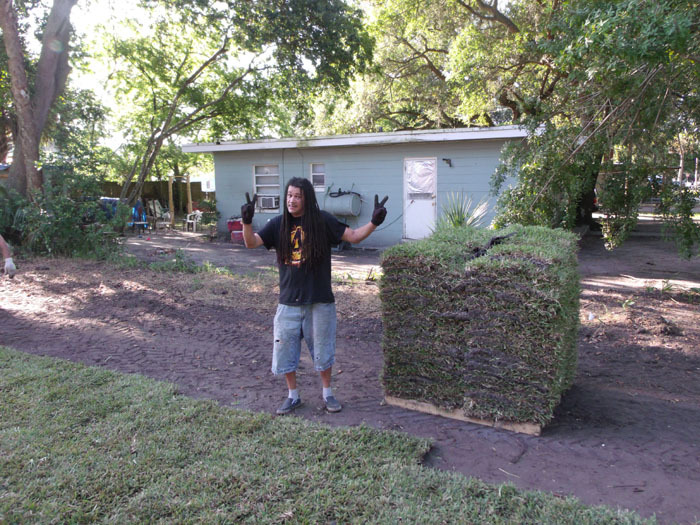 Andy recalls a time when a Bethune Cookman Sorority came out to volunteer at a job site. The women all wore military grade work boots decorated with their sorority numbers. Volunteering for Halifax Habitat even made the bucket list. Volunteering for Habitat was on Diane’s Bucket List. There are many lists a business can be featured on, but none are as rewarding as making a volunteer’s bucket list. This summer, volunteers Diane and Rick joined in on a project because of Diane’s bucket list. She said she always had it on her bucket list to volunteer at a Habitat House and this year was the year. Just like other volunteers, the experience was so memorable, Diane and Rick have already come back. 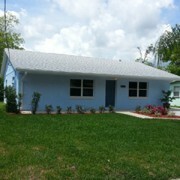 Do you have a volunteer story with Habitat for Humanity? Please share it with us. 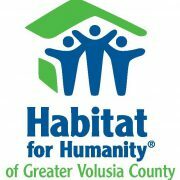 http://www.habitatgvc.org/wp-content/uploads/2015/08/Work-Day-at-331-Halifax-Habitat-for-Humanity.jpg 525 700 Habitat for Humanity of Greater Volusia County http://www.habitatgvc.org/wp-content/uploads/2016/08/GreaterVolusiaCounty_Hz_2color-2-300x115.jpg Habitat for Humanity of Greater Volusia County2015-08-28 16:33:542018-07-31 14:03:18What is it like to volunteer for Halifax Habitat for Humanity?